Radiation is all around us. It’s coming from televisions, tablets, and laptops. It’s coming from radio towers, and it’s coming down from satellites. Without climbing inside of a cave, it’s actually pretty hard to entirely escape it. That also means the ubiquitous nature of EMF is tricky to measure without a highly sensitive instrument. When you want to choose a solid EMF meter, it helps to know the reason why you’re measuring in the first place. Because there is no such thing as one meter that can fill every need. Picking the right meter requires you fill in a couple of blanks. The first thing you want to ask? What it is you wish to measure. Are you trying to measure magnetic fields, like may be coming from power lines, appliances, and cars? Do you want to measure electric fields from like lighting, extension cords, and monitors? 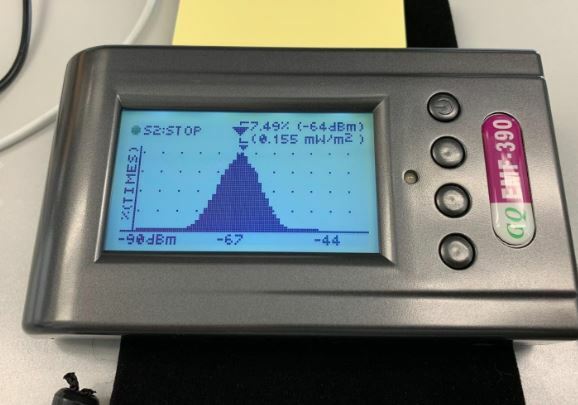 Are you trying to measure radio waves emanating from cell towers, microwaves, or Wi-Fi connections? How about dirty electricity in wiring, or body voltage in appliances? Different EMF meters and detectors are made for different purposes. How sensitive and accurate you need your meter to be? In other words, do you need a meter that’s capable of picking up faint signal traces? Can you only detect strong signals? Is the device capable of getting within a couple of Hz in its measurements, or are you looking at ballpark figures? Once again, depending on what you’re looking to do with the meter, you’ll want a different type of meter. But suffice to say, more accuracy and more sensitivity will increase the cost of the instrument you end up selecting. Consequently, it’s a good idea to select an EMF meter & detector that provides the lowest accuracy and sensitivity that is still functional for your intended purposes. How complicated is the instrument? How difficult is it to take a reading, and then use that information in a practical way? Can the data you collect be ported off the device in some way? Do you get the readout in an analogue display or digital display? Can you see measurements you’ve taken from a distance, or is the display too small? These kind of details add up, and they help shape the performance of the EMF reader/detector. Like almost any measuring instrument of this type, you’ll want to think about the portability of the EMF meter/detector. Whether or not the instrument is sufficiently portable can make-or-break a selection every bit as much as its actual features. Sturdiness also relates to portability. If a handheld instrument isn’t made to survive being accidentally dropped, then it’s usually not worth grabbing. 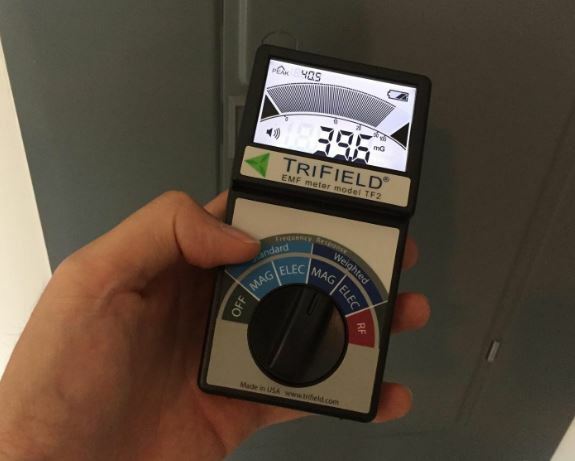 The TriField TF2 detects the three most basic types of EMF pollution, including RF/microwave, AC electric, and AC magnetic. That’s possible because this instrument operates in a full 40 Hz – 100 kHz range on AC magnetic and AC electric. Its peak hold capabilities can help you capture even the fastest EMF pulses. With its sensitivity is down to about 0.1 milligauss, or 1 V/m, this meter is designed for general use purposes. Outside of educational circumstances, it’s probably not enough to take precise scientific measurements. But it’s enough for most forms of practical use. 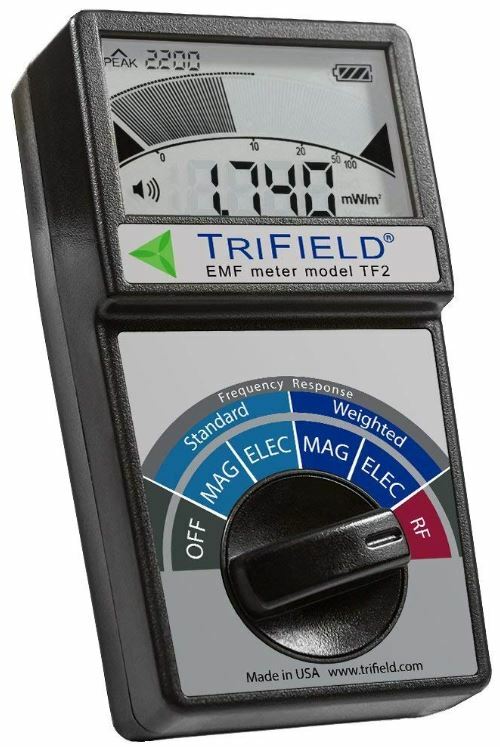 The TriField EMF Meter Model TF2 measures 1.5 x 2.8 x 5.2 inches, and it weighs about 13 ounces. The topside has a display that measure about 2.4 x 3 inches. The display shows a moving slider dial, along with a large numerical reading that displays mW/m. There’s a battery reader as well, though it’s not very precise because it only shows you how many bars are left. Better than nothing, I suppose. Though the chassis of this meter isn’t especially attractive, the display has an adjustable backlight. That makes it much easier on the eyes. It also makes it much easier to read the 1-axis data readings, and helps the display keep up with the relatively fast indicator bar. For showing hotspots within an area, that’s pretty handy. At the base of the device, there’s a large black dial that can be turned between six settings. The leftmost setting is the off-setting. Turning right from there, you can move through taking standard and weighted frequency response measurements under MAG/ELEC categories. Turned all the way to the right, you’ll take RF readings. The color coding on the dial is fantastic because having three separate colors makes this pretty easy and intuitive to use. It could’ve been complicated very easily, as EMF meters often are. The TriField TF2 is powered by a 9V alkaline battery. With the backlight turned off, you can get about 20 hours of power out of the battery. When you turn on the backlight, you’ll discover that the battery lifespan falls closer to 12-hours. In other words, you’ll want to flick off the backlighting when it’s not absolutely necessary. The Advanced GQ EMF-390 is a multi-function EMF and ELF meter. 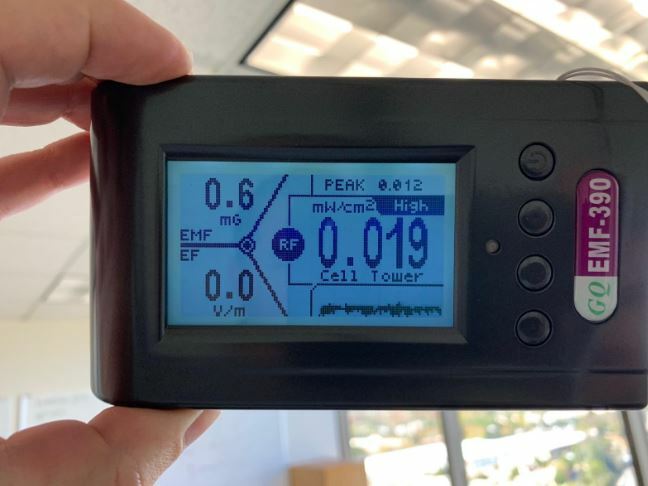 Originally developed in Seattle, this instrument is a redesign of classic EMF meters, now intended to be convenient above all other things. As such, it’s great for general purpose testing, but it also has some ancillary applications to scientific testing and governmental reporting. Multi-sensor function is essential to being able to deliver an accurate picture of the electromagnetic field. 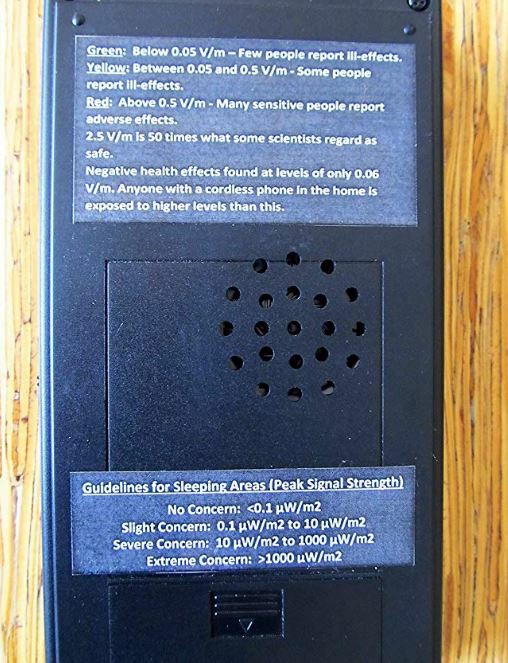 Consequently, you might use the GQ EMF-390 for cell phones, cell towers, power lines, and so on. The sky is the limit, and in a literal sense. This meter measures about 5.5 x 3 x 1 inches, and it weighs about 9 ounces. Though it can still fit in your hand, it would be a mild exaggeration to call this a handheld device. 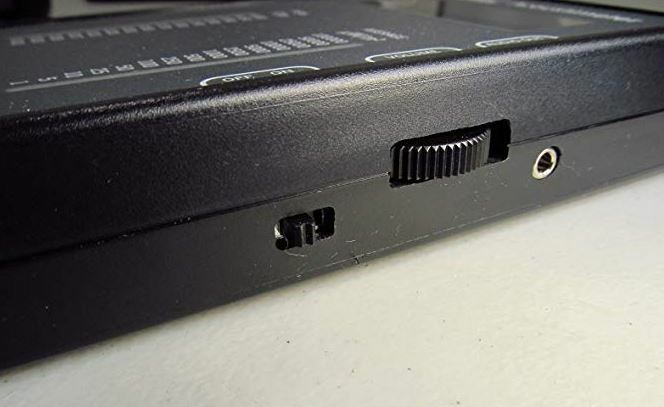 The front face of the device has four simple operation buttons. Unfortunately, only one of them is labeled, which is the power button. The display is fairly small. It measures roughly 1.2 x 2.6-inches. But it provides full clarity if you’re within touching distance of the display. When you’re more than a few feet away, the readability becomes a bit poor. Just about the worst thing you can say about this meter is that the display looks like a graphing calculator. It’s not exactly a high resolution display, but it’s clear and visible. Pretty much exactly what you want for showing different types of data. It’s just not very pretty. The graphic function provides real-time data readings, positioned alongside a graph of the past 45-seconds of data collection. The browser can also visualize RF radiation across your screen. And there’s a RF spectrum analyzer for advanced users to determine the signal strength of a particular frequency. For instance, distinguishing between overlapping Wi-Fi and microwave signals. 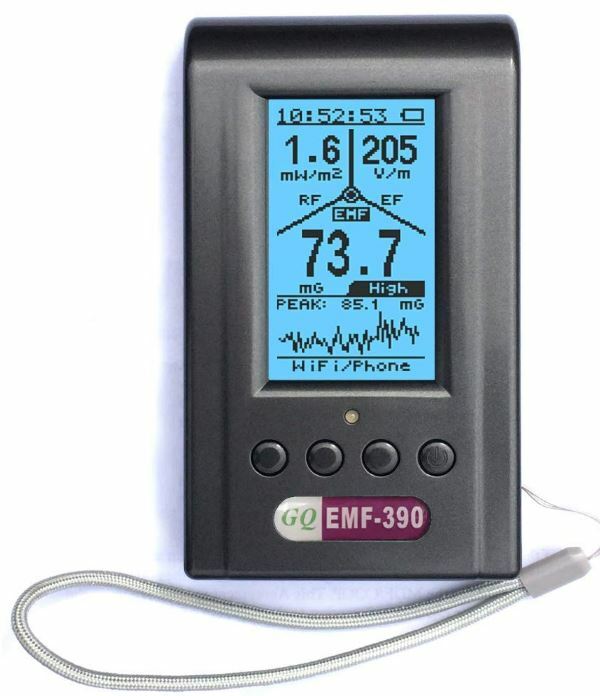 The GQ EMF-390 includes a built-in alarm feature. The alarm will sound both an audible noise and a visual effect, so it’s great at getting your attention. And luckily, it’s possible to disable the sound if you get tired of hearing it. How does your data get saved? The built-in flash memory has formidable support for data logging, which includes timestamps for all the data collected. History can be downloaded after the device is linked up with a PC. You can get the data sync software from their website. You’ll find it works on basically every platform in existence, from Linux and Windows, to Mac and Android. The GQ EMF-390 will not do a good job detecting and analyzing 5GHz Wi-Fi connections. One flaw with this device is that it places all your readings into one display, so it’s tough to compare different readings on the fly. As you move between various windows on the display, you can write down data for comparison, but actually tracking it in real time is a little more challenging. The Acoustimeter RF Meter Model AM-10 can measure EM radiation from Wi-Fi signals, radio towers, phones, and other common types of EMF. It’s arguably the easiest instrument to use on this list. The side of the unit has a simple switch and control wheel, which can be used to navigate the AM-10 and its control settings. The whole thing is quite intuitive. Perhaps more importantly, this meter has fantastic sensitivity. Even when signals are fairly weak, the Acoustimeter AM-10 is pretty good at picking them up. Though the AM-10 is a little on the expensive side, that’s simply because there’s more power packed inside this unit. The Acoustimeter AM-10 measures 8 x 2 x 6 inches, and it weighs just shy of a pound. Truthfully, it doesn’t look very stylish. It looks a bit like an old calculator with a large speaker on the back. It even has a battery port where a calculator might have one. You need to insert a pair of AA batteries to power the device. The front face of this EMF meter looks a little complicated at first, but this is actually one of the simplest RF readers that you’ll ever come across. By only using the display, a couple of LEDs can inform you all about the strength of various readings. Data captured includes both the peak and average measurements, and always within a reasonable range of approximation. On the backside, there are instructions on the meaning of the various readings you can take with this meter. The instructional panel clearly outlines the detection range of the green LEDs, as opposed to the yellow LEDs, or red LEDs. Once you’re familiar with the device, that can give you a quick visual approximation of how much radiation is around you. Additionally, it makes this EMF meter/detector pretty accessible to people who aren’t familiar with operating this kind of instrument. If an inexperienced person is expected to take measurements, the AM-10 allows that person to be successful with minimal training. The AM-10 was made in the United Kingdom. It includes a nylon sleeve, plastic carrying case, two alkaline AA batteries, a user manual, and a two-year warranty. Even though two AA batteries are included, you’ll want to have some replacements ready. The included batteries aren’t very good. 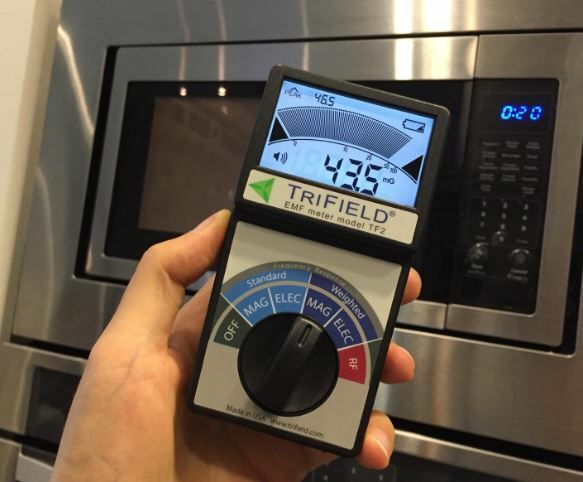 The TriField EMF Meter Model TF2 has an interface that looks pretty cheap and crummy. But looks can be deceiving. What wasn’t spent making an attractive LED interface was instead spent making high quality sensors. The analogue interface is intuitive, even if it does feel a bit dated. Given its low cost and wide abilities to measure and detect EMF, this sensor is worth picking up. There are lots of things to like about the Advanced GQ EMF-390. Its portability is fantastic, especially with the built-in lanyard strap. Ease of use is pretty good, mostly because you only use four buttons to operate the device. Sadly, there are a few things to dislike as well. The screen is a bit cramped. But for measuring RF between 10GHz and EMF up to 400KHz, this detector will certainly get the job done. 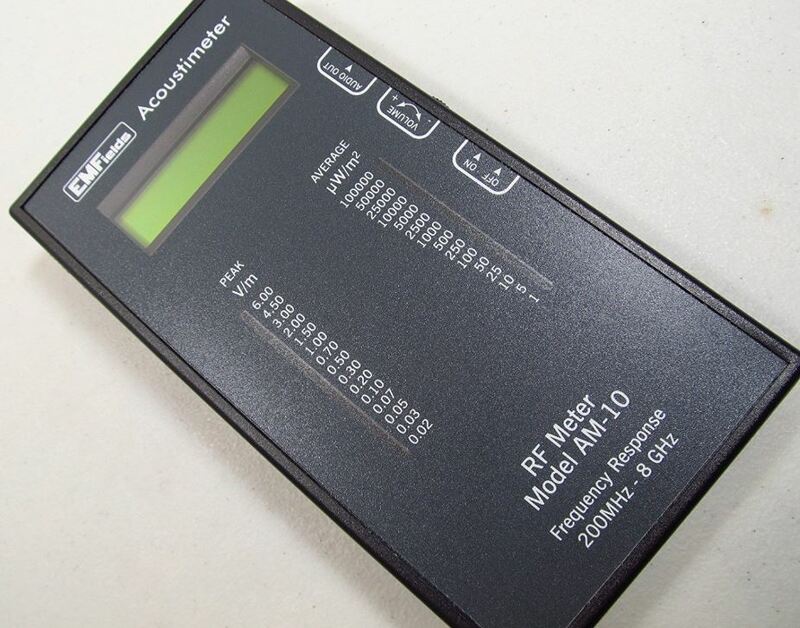 Finally, the Acoustimeter RF Meter Model AM-10 looks like it should be the most primitive reader on this list. But in most ways, it’s actually the most advanced. The interface is basically idiot proof. And there are instructions on the back of the unit. That makes this a great meter for educational purposes, and for inexperienced users. On top of that, it’s also incredibly effective at detecting weaker signals. Trying to suss-out a weaker signal? The AM-10 is probably your best bet. – Can you direct me to an up to date reliable site that provides levels of milliguass that are safe for adults and children. – From your article above, the Cornet ED78S would best fit the bill. Is that correct, or is the Trfield also useful? Can this meter be any use for CE/FCC precheck compliance? What is the best EMF Meter to measure 800 mhz -28ghz?